I was invited to give another talk at FRI Žilina. Previous topic was development for Google Android platform. This time I focused on jQuery.Together with Michal Kaukič we started jQuery workshop. Attendees learned basics of jQuery in two hours. At the end they have running application with simple animation in HTML. You can download slides in PDF version. You can also download ZIP file with all demo applications. I suggest to download also jQuery Cheat Sheet, it is very handful manual. I mentioned two interesting projects. One was Adobe Browser Lab which allows you to get snapshot of your web site displayed in different browsers on different systems. The second project was jQuery Mobile. This project could help you to create applications for mobile environment. I provide this workshop also in form of training for companies. You can find more details about available trainings at sinusgear.com. It is quite easy to create mobile version of application with Flash Builder Burrito “Preview”. You can run and test this application with Google Android emulator. There are few tricks how to achieve it. 1. Download Flash Builder Burrito and Android SDK. 2. Unpack Android SDK, run SDK manager, download all updates. 3. Add two paths to your PATH system variable: Flex SDK/bin and Android SDK/platform-tools. You will be able to run adt (Flex) and adb (Android) commands. 4. Create Virtual Device in Android SDK Manager. Target platform must be Android 2.2. Android 2.3 does not work with emulator version of AIR. Start this new device. 6. 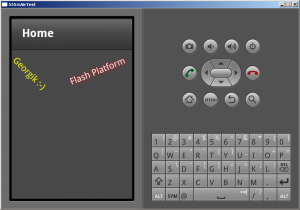 Create Mobile project in Flash Builder. Try to run it. It will create some files in bin-debug directory. Note: cert.p12 could be create by Flash Builder in “Export release build” step. performance – Air on Android Emulator is quite slow. Real HW is much faster.